Hello everybody and welcome to today’s blog. I hope you are having a great day and are all enjoying the blog so far. I am going to start a series on professional sports and we will start today with the National Pastime, Major League Baseball. Where to Go – Most major league parks are very fan friendly these days. 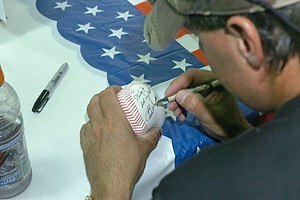 With the declining popularity of professional baseball players seem to be more willing than ever to accommodate an autograph request. There are two back ways to obtain signatures at the ballpark. Field Level Seats are a great place to chat with players and get autographs before the game. This is especially true if you can get there as soon as the gates open before it gets too crowded. The best Ballpark for before the game autographs – Miller Park, Milwaukee, WI home of the Milwaukee Brewers. After the Game is really my favorite place/time to get my signatures. You can find out where the players come out after the game from almost any usher. All you do is wait there and the players/coaches will start coming out after the game. They are almost always generous with their time and signatures particularly after a winning effort. The best ballpark for after the game autographs – Anaheim Stadium, Anaheim, CA home of the Los Angeles Angels of Anaheim. Thanks for reading and if you would like to check out my EBay store hit the link below. That’s all for now. This entry was posted in Autograph Shows, Autographs, book signings, Celebrities, Collectibles, Hobbies, Signatures, Uncategorized and tagged Andre Dawson, Antiques and Collectibles, Autograph, Bobby Doerr, Brooks Robinson, Collecting, Hank Aaron, Los Angeles, Willie Mays, Willie McCovey, Yogi Berra. Bookmark the permalink.